Oyster shells are becoming increasingly scarce. 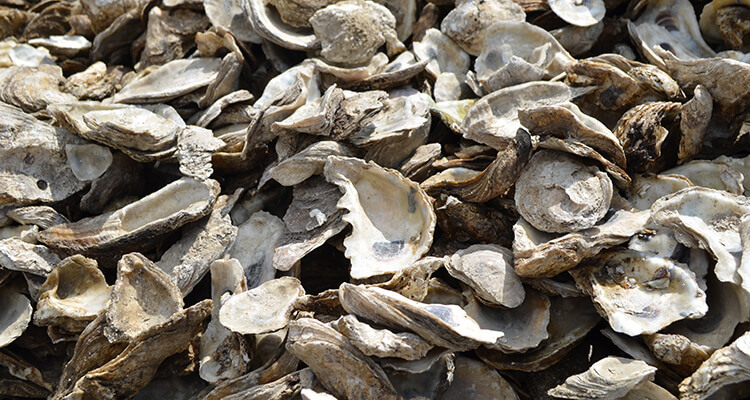 Through oyster shell recycling programs, shells that would typically be thrown away are saved and used in a variety of oyster restoration projects. Following are lists of locations in Maryland and Virginia where you can drop off your oyster shells, as well as restaurants that participate in oyster shell recycling. These are not comprehensive, please check back as we add more. As of now shells are being collected in orange bushel baskets by the dumpster. A small bin will be built soon in the same location. Gates are open to drive up to the bin from 8:30 a.m.-5 p.m. otherwise use walking path. Bin located to left of the building. Please go to Household Hazardous Waste and Electronics. Open Monday through Saturday, 10:00 a.m. to 2:00 p.m. for Norfolk residents. Bin located all the way to the right, behind the building. Bin is located in front of the school, off bypass road next to the chain link fence—near bus parking. From Granby Street, take the Zoo entrance and then the first left all the way to the end to the Ernie Morgan Environmental Action Center. The shell bin is to the right of the building against the fence. Bin located under the Birdsong Wetlands kiosk. Please call 757-441-1347 when shells are dropped off. Bin located in the first parking lot to the right. The shell bin is located in the rear of the school behind a black fence. Bin is located in the parking lot to the far right. Bin is located in front of the restaurant. Shells can be left in orange bushel baskets by shell washer. Bin is located near the Alexander Galt House and Munford Hall.